…or if truly one-of-a-kind custom autographed or otherwise blinged-out chumbys from celebrities are what you’re after, check out: http://stores.ebay.com/chumby-store and bid on one of the celebrity chumbys — with proceeds going to various good causes. Okay, chumby is really an interactive media player that constantly streams your favorite parts of the internet in a fun, always-on, always-fresh format. So quite a bit more than just a radio, even a really cool one that streams tens of thousands of internet radio stations, and podcasts and, announced today, Pandora! 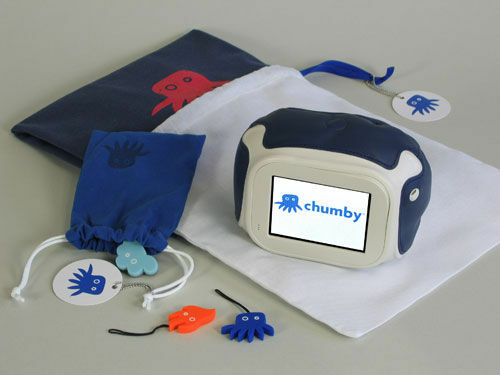 But, in fact, chumby isn’t really a radio, or an iPod boombox, or an IPTV, or, frankly, even an “interactive media player.” It is chumby. It is new and very different from other devices that require you to search and browse for information. Chumby was designed from the beginning to take all your favorite parts of the internet, whether they’re video clips, or internet radio stations, or anime cartoons, or sports scores or the weather, or anything else, and, using your existing wi-fi connection, simply deliver them to you at a glance. Automatically, one after the next. You just leave it on — don’t worry, your carbon footprint isn’t getting much deeper, chumby draws far less power than a light bulb. No need to go to your study and boot up your computer and launch a browser, no need to fish your smartphone out of your purse and launch the browser application (…and wait) to get your favorite bits of online goodness. And, to me, the best part of chumby is that it just keeps getting better — not next year’s chumby, but the one you buy today (after hearing all this you are going to click on the “buy a chumby” button, right?). You go to sleep one night and, when you wake up the next morning, voila, we turned your chumby into a Pandora radio — it happened automatically, you didn’t have to do anything, and it didn’t cost you a dime. All the chumby services are free because sponsors occasionally offer additional content to you, so they essentially pay the cost of the bandwidth to deliver you the free chumby service. And you’re not just counting on chumby industries to keep improving chumby: a huge community of smart developers and programmers is working all the time to constantly create new content and capabilities for you. My latest favorite is “chumbyland,” a virtual world where your avatar travels from your chumby and visits other chumbys, makes new friends (“chums”), and brings back stuff. Some people can’t quite get their head around why they need chumby or what it will really do for them. Personal Anecdote #1: last night I was doing the dishes (yes, I know, I have bored you with my dish-cleaning exploits before) — but I actually volunteered to do the dishes last night because I knew that, while doing so, I could listen to my Pandora “Quick Mix” of David Bowie, the Rolling Stones, Neil Young, and Rage Against the Machine (Tip: nothing removes baked-on food better than Rage Against the Machine). So get chumby and put it near your sink — you’ll thank me. Personal Anecdote #2: I use chumby as an alarm clock and I awoke this morning to WQXR playing Brahms, got the latest news update on the global financial melt-down, and saw pictures of my family vacation this past summer — so 2 out of 3 of these things made me happy, the other? Feh! Walked into the kitchen, made coffee (I didn’t use chumby for that — maybe we should add this capability), used my kitchen sink chumby to tune into a New York Times podcast of the front page stories — sort of wished I hadn’t heard them, but was delighted to learn that simply adding a fan to a baby’s room can dramatically reduce the incidence of SIDS. News you can use. My point is that, unlike most other devices that are “single purpose” and that everyone uses the same way and so are easy to understand and explain, chumby is what you make it — everyone will probably use theirs somewhat differently. That’s the point and that’s what so great about it. And your chumby just keeps getting better — automatically and for free. You’ll love it even more next year than you do this year (hard to believe, I know). So get chumby and tune into Pandora. And remember that tip about the crusty food and Rage Against the Machine.